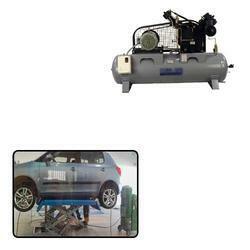 Manufacturer of a wide range of products which include air compressor for automobile industries. In order to provide maximum satisfaction to our clients, we engage in using the finest raw materials and modern machines for manufacturing Air Compressor for Automobile Industries. Because of this, the offered range has a longer functional life and a commendable resistance to corrosion. In addition, the offered range provides a superior functionality and is marked at the best rate possible. Looking for Air Compressor for Automobile Industries ?